The synagogue of the Jewish Community of Temuco, founded in 1929, is the oldest synagogue in Chile and the southernmost of America. Its architecture is inspired by the Aragonese synagogue Monastir (ex Yugoslavia, Macedonia), from where came the first members, which in turn were based on the style of the synagogues of Aragon in Spain. 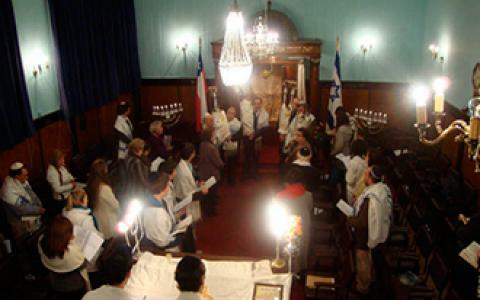 While it is a small community, it has maintained for more than a century the mission to gather and welcome the Jews of southern Chile. In its heyday, during the first half of the twentieth century it had more than 300 families and a vibrant social life. Today, 20 families are those prevailing in the city, composed of young Jewish couples who have come to live in the city both from abroad and from other cities in Chile, 15 minors and intermarriage become and remain within the Judaism in the Kehila. This community also represents an emotional attachment to many Jews of Chile, whose roots link them to its starting point for other communities founded in Chile.